Sticking to a healthy lifestyle can be tough while traveling; don’t let the lure of deep-fried dishes steer you away from healthier food options that are just as delicious. If you are in the need of a deep-fried detox in Bangkok, make a pit stop at Ari off the BTS Skytrain to find the best and healthiest options. Do not let Buono at Basement’s location fool you — this underground restaurant is committed to cooking with the freshest of ingredients and healthiest of products. Buono at Basement just opened last year but is already overrun daily with people on their lunch breaks. Be assured that whatever you order here is made with the freshest ingredients and will be equally as delicious. You have the freedom to personalize any meal on the menu as well; choose from an entire list of add-ons, including eggs, vegetables, tuna and more. Also, any meal can be made vegetarian, piled high with tofu or protein of your choosing. Buono at Basement is reasonably priced, with pizza for ฿90, sandwiches for ฿69 and even garlic bread for ฿49. Right outside Buono at Basement is Love Salada Salad & Sandwich, a quaint vendor tucked between a mango stand and a cupcake shop. Salads are hard to come by in Thailand unless you are ordering its famous som tum salad; if not, good luck finding one for a reasonable price. Love Salada, however, has both delicious salads, home dressings and fair prices. Satisfy your need for greens with a tuna salad (฿79), chicken salad (฿79), bacon and egg salad (฿89) and much more at this tiny shop. A few blocks down from Love Salada is Mr. Gunn. Here, you will find its refreshing smoothies next door to a swanky, Korean restaurant. This shop has every type of smoothie you could ever imagine — looking to detox? Order its detox juice, made up of carrots, apples, beetroots and lemons (฿50). Looking to keep your energy up after a long day of exploring? Order its power up juice, made of carrots, apples and pineapple (฿50). Whatever smoothie you choose, you will not be disappointed; Mr. Gunn is serving up a variety of original smoothies made from fresh fruit, yogurt smoothies and 100 percent natural juices. Oh My Goodness is not your typical restaurant, but certainly serves up enough food to be considered one. 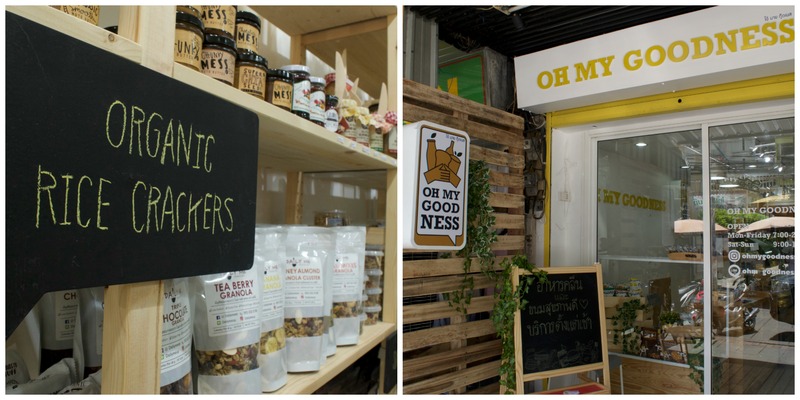 This new healthy food shop just opened up this past month in Ari. Our favorite item had to be the endless rows of granola and snacks so delicious that you might question just how healthy they really are. Notable favorites include skinny brownies, endless rows of cake and more. Oh My Goodness has an entire fridge filled with meals ready to grab on the go, as well as plenty of snacks to choose from. Good Monday is serving up the freshest juices and smoothies; choose from any one of their delicious combinations, which can have up to five different fruits in them. These juices are ฿35 for a small juice and ฿60 for a large. Smoothies also range between ฿40-50, depending on the type of fruit you want to enjoy.